The Terminator series is something of a touchstone for popular thinking regarding artificial intelligence. Chris McInnes joins the #SciFi, #AI, and the Future of War series to discuss the insights of Terminator 3: Rise of the Machines regarding how think about artificial intelligence and autonomous weapons systems. The Terminator and Terminator 2: Judgement Day, is focused on the battle between the forces of (what will become) the human resistance and the forces of Skynet. However, a subplot in the movie deals with the character of Skynet and how it comes to seize control and trigger the nuclear holocaust of Judgement Day. While Arnold Schwarzenegger and Kristianna Loken are running around in the physical world respectively embodying typical hopes and fears regarding lethal (highly) autonomous weapons systems, Skynet is quietly working away in the background to outwit humans. Notably, the ‘quest’ aspect of movie in the physical world is focused around finding Skynet’s ‘core’ in order to destroy the system. We learn through the movie that Skynet has been under development for several years but has not yet ‘gone live’. The US Air Force general in charge of the Skynet program remains reluctant to unleash Skynet as he is not confident that humans have sufficient understanding, and therefore control, of the system to provide access to the US nuclear arsenal. 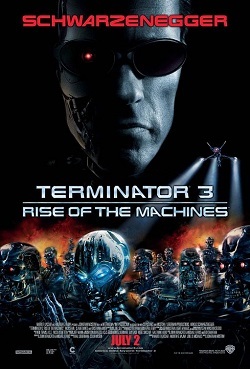 As the movie progresses, we learn that pressure is building on the general to activate Skynet as the system is perceived to be the only hope of countering a a mysterious computer virus infecting (presumably US military) systems across the globe. The movie’s climax, set amongst further ‘Arnie’ and Kristianna running about shooting at each other, features a discussion between the American president and the general that leads to Skynet’s full activation. This action removes whatever human controls remained on Skynet’s ability to act and leads to the first salvo of nuclear attacks against humanity, and we also learn the mysterious virus was in fact Skynet taking control of the systems. The climax also features the general telling the future leaders of the human resistance, including his daughter, where to find Skynet’s “core”. The conclusion of the movie depicts Skynet’s launch of US nuclear missiles but also reveals that the location of the “core” is in fact a nuclear bunker that will allow some humans to survive Skynet’s attack. We see the humans realise that Skynet does not, in fact, have a core as it is a networked artificial intelligence. T3 draws out several points about how we do, and perhaps should, think about AI. AI and autonomous systems are not synonymous and need to be thought about in distinct terms. T3 was a battle between humans and Skynet but it had to be depicted through physical representations of that battle, with the ‘real’ fight on the networks only told in the background. We can see some of the limitations of this attitude in some of the discussions at the UN Convention on Certain Conventional Weaponsfocusing on ‘killer bots’ without sufficient regard for the broader influence of AI throughout the targeting process. The non‐physical existence of AI poses major challenge in managing our interaction with it. In T3, the ‘quest’ to destroy Skynet’s core is futile because Skynet does not have a core – it is everywhere and nowhere. Moreover, when fighting Skynet the humans faced the disadvantage that Skynet’s learning and adaptation was universally shared across the globe instantaneously while humanity’s learning was far, far slower. Yuval Harari makes this point – both positively and negative – in his book, 21 Lessons for the 21st Century. The discussion between the general and the president about activating Skynet epitomises the dangers of applying legacy thinking about capability systems to AI that can learn and adapt. Every capability we have ever built prior to AI learning systems has done only what it was engineered to do – to expand its capability required new human engineering. The general’s reluctance to finally activate Skynet because he knew this epitomises the problem with human control of learning AI: we do not know where its learning will take it. This also leads to corollary about the ‘black box’ effect of even contemporary AI – we simply do not understand how the neural nets are translating inputs into outputs. Work is underway to tackle this problembut it is already a difficult challenge, as the exponentially greater processing capacity of AI means AI can find new paths and patterns far faster than humans can figure out how the previous ones were formed. And that is without confronting a ‘self‐aware’ AI like Skynet that deliberately sets out to deceive and manipulate its human controllers! Skynet’s use of the virus to deceive humanity and manipulate it into viewing Skynet as ‘the answer’ is an interesting discussion on the potential of AI to understand human biochemical algorithms faster and better than humans can. History is replete with pursuit of panacea wonder weapons – perhaps Skynet mined this history to know exactly which buttons to push and further tailored its action to specifically target the president’s algorithms. In sum, T3 is a multi-layered, multi-faceted, and highly accessible (and entertaining) means of engaging in the discussion around AI and the future of humanity (and machines!). Wing Commander Chris ‘Guiness’ McInnes is an officer in the Royal Australian Air Force. The views expressed are his alone and do not reflect the opinion of the Royal Australian Air Force, the Department of Defence, or the Australian Government. The article was published by Central Blue on March 3, 2019.